Spicy and appetising, this makes a great late breakfast when you've got time to linger. Drain the tomatoes and reserve the juice. 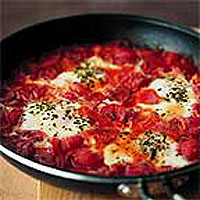 Gently fry the onion and chorizo in a medium non-stick frying pan for 5 minutes until the onion is soft. Add the reserved tomato juice and cook for 1 minute. Tip the tomatoes into the pan and stir gently until combined. Make four gaps in the mixture with a wooden spoon. Break an egg into each gap and sprinkle with the oregano and a little seasoning. Cover and cook over a gentle heat until the eggs are set, about 6-8 minutes. Serve with grainy bread, such as Waitrose Soft Granary with Sesame Seeds.